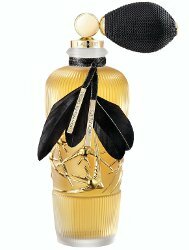 Lalique will launch Mon Premier Cristal Hirondelles, a new limited edition fragrance celebrating the brand's 130th anniversary. Mon Premier Cristal Hirondelles was developed by perfumer Nathalie Lorson. The notes include three kinds of jasmine, plus tuberose, freesia, gardenia, vanilla, heliotrope and musks. Lalique Mon Premier Cristal Hirondelles features the swallow motif in 23-carat gold plate; a crystal stopper and optional atomizer pump are both included. 130 bottles were made (£910). It will debut at Lalique boutiques in March, along with a collection of home fragrance items including a diffuser and several candles. Damn, it sounds great, pity they are only releasing it in that gorgeous but $$$ bottle.